When a third-party application wants to identify you by your GitHub Enterprise login, you'll see a page with the developer contact information and a list of the specific data that's being requested. Because an application is developed by a third-party who isn't GitHub Enterprise, we don't know exactly how an application uses the data it's requesting access to. You can use the developer information at the top of the page to contact the application admin if you have questions or concerns about their application. If the developer has chosen to supply it, the right-hand side of the page provides a detailed description of the application, as well as its associated website. 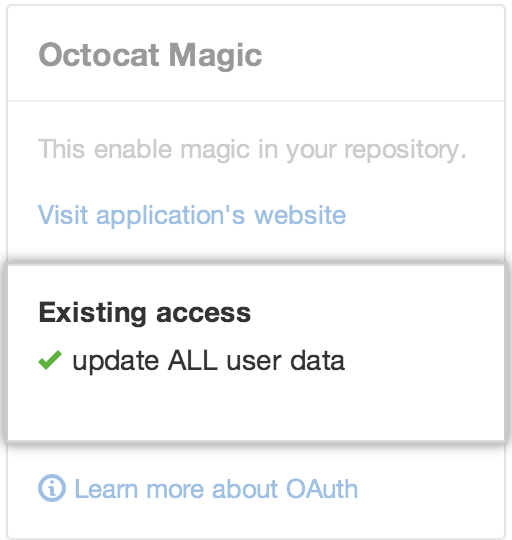 Applications can have read or write access to your GitHub Enterprise data. Read access only allows an application to look at your data. Write access allows an application to change your data. Scopes are named groups of permissions that an application can request to access both public and non-public data. When you want to use a third-party application that integrates with GitHub Enterprise, that application lets you know what type of access to your data will be required. If you grant access to the application, then the application will be able to perform actions on your behalf, such as reading or modifying data. For example, if you want to use an app that requests user:email scope, the app will have read-only access to your private email addresses. 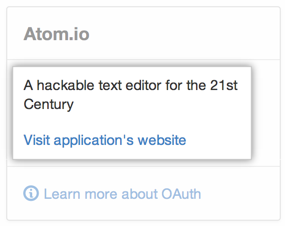 For more information, see "About scopes for OAuth Apps" in the GitHub Developer documentation. There are several types of data that applications can request. Tip: We recommend that you regularly review your authorized applications list. Remove any applications and tokens that haven't been used in a while. Commit status You can grant access for a third-party application to report your commit status. Commit status access allows applications to determine if a build is a successful against a specific commit. Applications won't have access to your code, but they can read and write status information against a specific commit. Deployments Deployment status access allows applicationss to determine if a deployment is successful against a specific commit for public and private repositories. Applicationss won't have access to your code. Gists Gist access allows applications to read or write to both your public and secret Gists. Hooks Webhooks access allows applications to read or write hook configurations on repositories you manage. Notifications Notification access allows applicationss to read your GitHub Enterprise notifications, such as comments on issues and pull requests. However, applications remain unable to access anything in your repositories. Repositories Repository information includes the names of contributors, the branches you've created, and the actual files within your repository. 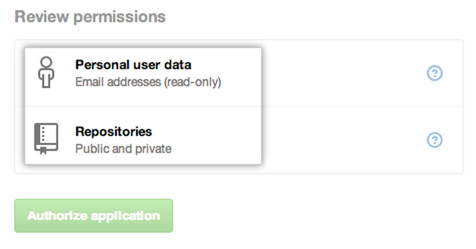 Applications can request access for either public or private repositories on a user-wide level. Repository delete Applications can request to delete repositories that you administer, but they won't have access to your code. Applications can request new access privileges. When asking for updated permissions, the application will notify you of the differences.